Experience executive camping at its finest! The perfect holiday escape for families and couples who just want the basics. Our cottage is located in a laid-back, safe, quiet neighbourhood. 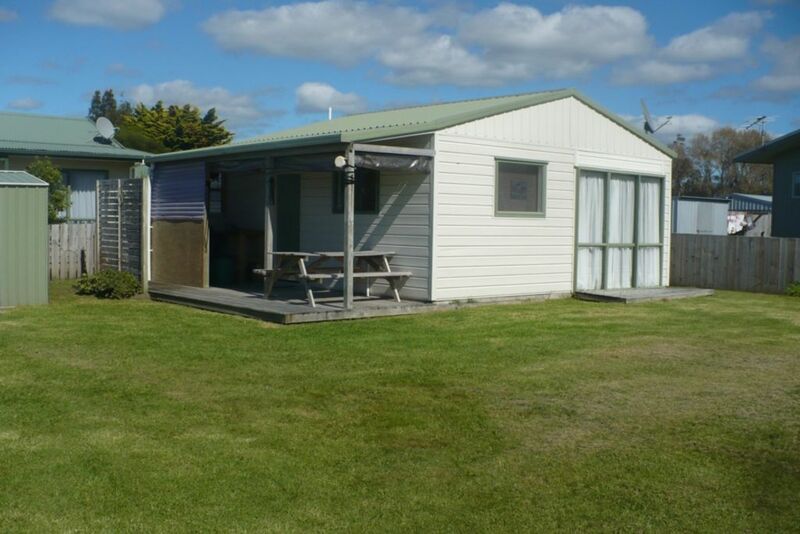 Cosy and compact self-contained 1 bedroom cottage on good-sized fully fenced corner section. We are only five minutes walk to Buffalo Beach. Covered verandah. Exterior power plugs for campervans and mobile homes. A great Kiwi alternative to a hotel or motel. Kitchenette with full sized fridge/freezer, benchtop mini-oven, and microwave. All the kitchenware you need (pots, pans, crockery, cutlery). 3 burner hooded BBQ with side burner. Bach sleeps five. Additional guests can camp on the property subject to prior approval. Great stay at the little pad. The accommodation was pet friendly and that was what we were looking for. We all enjoyed our stay. Thank you. Really appreciated being able to take the dog. Situated in a quiet suburban area 5 mins walk from a beautiful beach. Unfortunately there was an ant infestation in the bathroom and the shower and we had to buy two mugs from the charity shop as mugs provided were chipped and dirty. Thanks for the feedback. Please be advised that the ant issue has been professionally addressed. Regarding the need for replacements cups, please contact me via email to arrange reimbursement for costs incurred. New cups have now been purchased. Private, conveniently situated, spacious lawn and a very happy holiday. The property has obviously been previously enjoyed by people and families. The bach was solidly built, well insulated and with adequate facilities but is somewhat tired. On arrival the surfaces were generally tidy. On leaving we fulfilled our obligation to clean down surfaces etc as requested. However, the property really requires a regular professional clean. We would also recommend that items like the BBQ, fan, clothesline and laundry area be better maintained. Nonetheless we enjoyed our stay. The property was a bit dated but it was clean and was fine for a couple of nights . Quite good located close short drive to town centre. Kids enjoyed playing on the big lawn. House has everything you need. It was suitable for us 2 adults and two children. However, it will not recommand for more than 3 adults.